Building a home addition can frequently cost more than an interior home remodeling project. Consequently knowing how to properly and accurately estimate home addition costs is critical when contemplating building a home addition. Unlike finishing a basement or an attic conversion project, a home addition requires new ground and foundation work as well as exterior framing and construction. Consequently building a home addition is typically one of the more expensive routes for creating additional home living space. When planning a home addition, it is important to think through and list every phase of the project to most accurately estimate the total home addition costs. Creating this list also enables you to determine what type of subcontractors you will need for the project. For example, the new foundation work will require an excavator and a foundation installer at a minimum. If the home addition impedes upon an existing leach field or may go over existing underground power, gas or plumbing lines and pipes, septic installers and utility companies may need to be brought into the project. Calculating home addition costs is typically done on a cost per square foot basis. The accuracy of estimating home addition costs depends upon how thorough you are with planning your project and how solid your contractor and subcontractor quotes are. Consequently to accurately calculate home addition costs, it is imperative that your list of project phases is complete and that you obtain firm, fixed quotes from contractors. With a complete home addition cost estimate breakdown spreadsheet you can quickly calculate the total cost of your home addition. By taking this total cost and dividing it by the number of additional square feet associated with the new home addition you can arrive at a cost per square foot number. 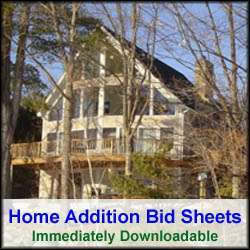 See my Home Addition Bid Sheets to learn more on how to plan and estimate costs for a home addition project. The cost per square foot of a home addition can vary widely depending upon where you live, economic conditions, and the type of home addition you are building. Home addition costs per square feet can also vary widely even on the same project. 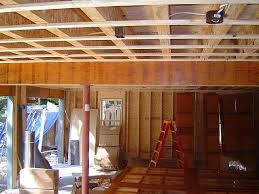 Thus it is important to get several contractor or subcontractor quotes for each phase of the home addition project. With multiple contractor quotes for each phase of the project you can determine a better total average cost per square foot for your specific home addition project. In addition, you can even determine an average cost per square foot for each phase of the project. With this information you can then determine which contractors/subcontractors are out of line with their specific quotes. Though home addition costs are typically higher than finishing a basement or attic, it may not always be the case, and thus a home addition maybe the most cost effective solution. Specific circumstances in finishing a basement, such as basement moisture problems or low hanging plumbing pipes could significantly increase the cost per square foot of a basement remodeling project. Consequently a basement remodeling project could potentially have costs that are on par, or even higher than building a home addition. So when contemplating building a home addition or creating more living space within the existing home, make sure you consider the total cost for each option. Home addition costs are typically more expensive then a home remodeling project, but not in all cases. It depends heavily upon your specific living space requirements, and your home’s unique set of conditions. It is also important to recognize that cost may not be the only factor in your decision process. Property setbacks and personal tastes on creating additional home living space can and should play a major role in your decision process. For more help on building a home addition and how to estimate home addition costs, see HomeAdditionPlus.com’s Room Addition Bid Sheet. The Room Addition Bid Sheet provides you with the knowledge on how to plan a house addition project, and what to look for when hiring contractors for your new home construction. It also includes a detailed cost breakdown table and spreadsheet for estimating your own new home addition building costs. Free Estimate Home Addition Price Quotes with No Obligation!